The C34 Jess Horn II was introduced in 1995. 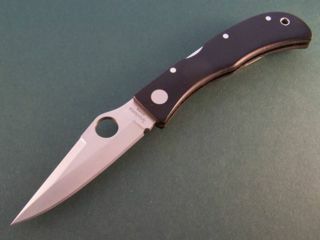 It was the second of three Jess Horn designs produced as collaboration models by Spyderco, the others being the C27 Jess Horn and the C38 Jess Horn Lightweight. The production versions have a Hollow sabre grind blade with a prominent Swedge grind and a black Micarta handle. In addition to the standard production version which was available in PE and SE, several special versions of the C34 Jess Horn II were produced exclusively for A.G. Russell. Two of these models had the same dimensions as the production model, but featured Full Flat grind blades with a Swedge grind and different colors of micarta. The other three were of a reduced size and are unique, in that there was no production equivalent in any form. They are known as "Baby Horns" and were made in white Micarta with a Full Flat grind blade like those of the full size A.G. Russell Specials, and in black Micarta and all stainless steel with Hollow sabre grind blades like those of the production C34. 3 History, mentionings from the forums, etc. The C34 Jess Horn II first appeared in the 1997 pocket catalog. Prior to that, it was noted as "coming soon" in the 1995 Spyderco Retail Price Sheet. History, mentionings from the forums, etc. "For those who desire a custom design without the associated cost or lengthy wait, Spyderco introduces the second CLIPIT collaboration with Jess Horn. This refined pattern incorporates Jess' precise lines throughout. The scales are made of Micarta in a comfortable shape for everyday use, and the hand-finished premium stainless steel blade is formed in a spearpoint style. The elegant look of this gentleman's lightweight folder makes it worthy of carry for any occasion." Plain and serrated versions of the production model, plus the five A.G. Russell Specials noted above and below. C34P Black Micarta PE AUS-8 1995- 1998 119.95$ - 98.95$ (1998) Unknown Hollow sabre grind 3- screw old standard clip TU RH ? C34PBRGM Burgundy Micarta PE AUS-8 1995 - ? 119.95$ Unknown Full Flat 3- screw old standard clip TU RH ? AGSP-1W White Micarta PE AUS-8 1995 - ? 119.95$ Unknown Full Flat 3- screw old standard clip TU RH ? AGSP-2W White Micarta PE AUS-8 ? - 1997 ? Baby Jess Horn Unknown Full Flat 3- screw old standard clip TU RH ? AGSP-2B Black Micarta PE AUS-8 ? - 1997 ? Baby Jess Horn Unknown Hollow sabre grind 3- screw old standard clip TU RH ? AGSP-2SS Stainless Steel PE AUS-8 ? - 1997 ? Baby Jess Horn, this was also known by the SKU CX08 Unknown Hollow sabre grind 3- screw old standard clip TU RH ? PE production version than in the SE production version. Collectors Club numbered examples of at least two of the A.G. Russell Special variants exist, are there Collectors Club numbered specimens of all of them? Production dates for the A.G. Russell Specials? The box for my black Baby Horn is dated 1/97. This page was last modified on 6 August 2017, at 22:57.